You can get unlimited free ice cream cones (depending on how willing you are to wait in line) at Ben & Jerry's Scoop Shops worldwide for their annual Free Cone Day celebration on April 9, 2019. 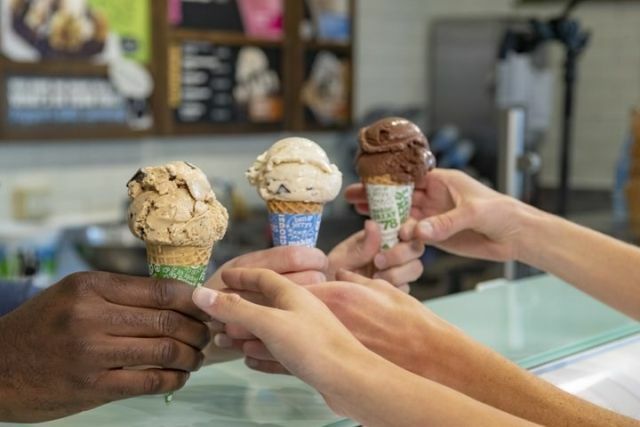 The brand plans to give out over 1 million scoops of ice cream throughout the day with flavors ranging from classics like Cherry Garcia and Chocolate Chip Cookie Dough to new varieties like new Cookie Dough Cores. If you've been missing out due to a dairy intolerance, they now have several non-dairy flavors as well. The event continues a tradition that started in 1979 when the founders of the brand, Ben Cohen and Jerry Greenfield, held their very first Free Cone Day at their first store in Burlington, Vermont to celebrate making it through their first year of business.